Gal Smiley, running up from the basement: Mom! I found something! 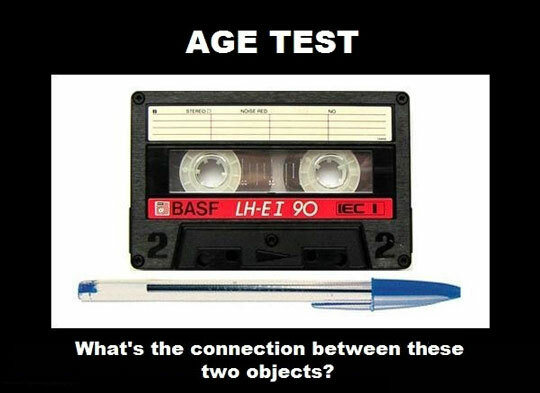 Me: That’s a cassette tape. It plays music, like a CD, only you need a different kind of playing machine. Gal Smiley: Does the thing in the basement play them? Gal Smiley: But when I press the buttons on it, it doesn’t do anything. Me: That’s because it’s not plugged in. Gal Smiley: So if I plug it in, we can play this tape? Gal Smiley, calling to the other kids: We can play it! We can play it! Let’s go! Captain Jelly Belly: Forget it, Gal Smiley…even if it does play, it’s going to be boring OLD PEOPLE MUSIC. Excuse me as I go soak my false teeth. GEEZ. Now I really have to know, what was on that cassette? I found a whole box of them a few years back, and in it was a MIX TAPE that my husband’s old girlfriend had made back in 1990. It had a Rick Astley ballad on it. I love that you used the word Boom Box. I believe it is a Moxy Fruvous tape, which was a band of four guy singers in Toronto in the 90s. They put out their own tape which they sold at their concerts. One of the guys in the band was Jian Ghomeshi, who is the host of Q on CBC radio now. Do you get that show out west? I’m not sure if it is nationwide. In any case, it’s the only one we have in the house – I pitched the others we had a few years ago, this one only survived by virtue of actually being in the Boom Box. Rock out! Too Funny! I’m pretty sure I have a small box of mixed tapes still kicking around my basement. While I had switched to CD’s for the most part, my last car had a tape deck instead of a CD player, so a selection of tapes lived on. But it’s been almsot 6 years since that car died, and I don’t think I’ve listened to any of them since then, so it’s probably time to toss them out. Also, I’m a big fan of both Moxy Fruvous and Jian Gomeshi. This made me chuckle so much. I was actually thinking of eight-tracks. So I”M OLD. Sometimes my hubs will tell the kids that things were in the olden days, before we had colour. Now they are old enough to laugh but it used to amuse us to no end. I used to love Moxy Fruvous. I still remember most of the words to King of Spain. I had no idea that Jian Gomeshi was in that band. Hm, learn something new every day. My kids do the same kind of thing. There are ‘their’ radio stations, and ‘old people’ radio stations. Guess which ones I listen to.